Over time, it is natural for debris and other substances to build up in	your drains. Unfortunately, this accumulation can sometimes lead to clogs	that cause significant damage. Although you can try to use store-bought	chemicals to take care of the problem, these chemicals can often be ineffective	and even dangerous. 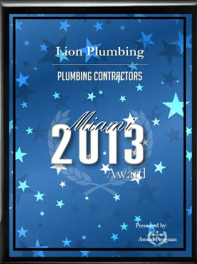 At	Lion Plumbing, Inc., we use water-jet drain cleaning, which is the method of using highly	pressurized water to clear out unwanted matter without the application	of abrasives or chemicals. Because of the high level of pressure that is used, our water-jet method	is perfect for cleaning out the heavy grease that builds up in commercial	sewer lines. This cleaning method should be left to an experienced plumber. If you would like to schedule an appointment or find out more about our	services, please	contact us at (305) 597-4555.